10% for the Groups booking at least one week before. 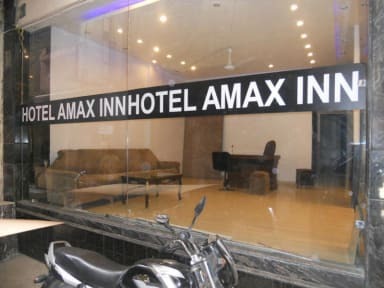 Hotel Amax Inn is centrally located just walking from New Delhi Railway Station. Hotel Amax Inn is Top Choice by Lonely Planet for 2nd Time in Delhi. Hotel Amax Inn is best Recommended by Lonely Planet and French guide Routard. 36 Rooms all attach Bath with Hot & Cold Shower. All the rooms are equipped with all the modern facilities. We appreciate the importance of clean facilities therefore we'll be cleaning all day long, making sure everything is spotless. Our facilities include bathroom attached, hot showers 24 hours a day, Wifi, Roof Top Restaurant . Doctors on Call, Laundry, Travel Desk, Lift and over all welcoming staff for 24 hours. Towels , Soap, Toilet Paper always free for the clients of Hotel Amax Inn. We ourselves of the Management is always there to help the Travelers for their enjoyable stay. Please Careful from the Auto /Taxi Driver some Time ,they make some Story & trying to take u another Hotel.